This poker hand ranking chart for beginner poker players is easy to study. It should be used as a resource to find out who wins a poker hand showdown. Beginning poker players often get confused about poker hand rankings and who wins in some situations. In the event of a tie, most poker hand ranking charts award the player with the highest suit the pot. The suit strength is based on the first letter of the suit. This is not true for Texas Hold em. If there is a tie in Texas Holdem the pot is split into equal portions and distributed equally amongst the winners. The official poker hand ranking chart can be found below. The strongest hand in a five card poker game is always a royal flush, unless the poker game is being played as a lowball game or a split pot game with an 8 or better qualifier. Those games are not something that you need to understand this early in your poker career. For now, lets just focus on the poker hand ranking chart and the strength of hands in comparison to each other. A royal flush is an ace, king, queen, jack, and a ten which are all the same suit. There is only one combination of this hand and it is the rarest of all poker hands. Split the pot amongst people who have a royal flush. A straight flush consists of five cards in sequential order and of the same suit. The person with the highest rank card at the top of the sequence wins. Four of a kind is four of the same rank card and another card. Highest rank four of a kind wins. In community games, the highest fifth card (kicker) determines the winner. A full house is three cards of the same rank and two different cards of a matching rank. The higher three card rank wins. In the event that this is the same, the higher two card rank wins. A flush is five cards of the same suit. The highest ranked card wins. If necessary, the second-highest, third-highest, forth-highest, and fifth-highest ranked card may be used to break a tie. A straight is five cards in sequential order. The highest ranked card at the top of the sequence wins. 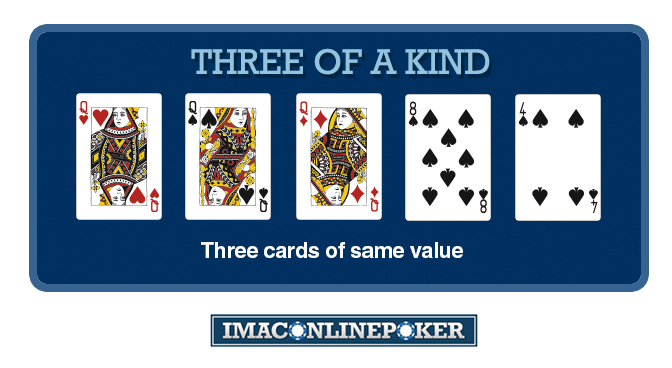 Three of a Kind is three cards of the same rank and two side cards. Higher ranked three of a kind wins. If necessary, the highest and second-highest ranked side card may be used. Two pair is two matching cards of one rank and two of a different matching rank, along with a side card. Highest matching pair wins, if this is the same then second-highest matching pair wins. In the event of both pairs matching, the side card (kicker) determines the winner. A pair is two matching cards of the same rank and three unrelated side cards. Having one pair is more powerful than having no pair. Highest pair wins, if players share the same pair, highest side card wins. If necessary, use the second-highest and third-highest side cards. High card is any hand that does not qualify for the above hands. Highest card wins. If necessary, use second-highest, third-highest, forth highest, and fifth highest cards to determine the winner. Here is a printable poker hand ranking chart for you to take with you. If you reduce its size, or fold the paper you print it on, you can take it with you on the go. This poker rank list will be helpful for playing your first time in a live casino or card room. To print the hand ranking chart, simply click the image below and print the page it brings you to.